Began in 1987/88 as a response to federal mandated sewage and water upgrades, the Water Works of Columbus along with local government and civic leaders began a partnership that has resulted in one of the cities premier tourist attractions. Concept plans were done by the Architectural Firm, Hecht, Burdeshaw and Johnson. The award winning engineering design was done by Jordan, Jones and Goulding, both an Atlanta and Columbus based environmental engineering consulting firm. This design template is still in use today as additional phases are brought in, and a changing usage base is cultivated. Original construction began in 1989 and Phase I had a grand opening on Columbus Day 1992 with a large kazoo parade behind Golden Park. This one-mile area spanned from the dam at The River Club to behind the Trade Center, it featured restrooms, ADA accessibility and easy access from downtown at Bay Avenue. Phase II was a large project that took the length of the Riverwalk to 12 miles. It passed Golden Park, The Civic Center, Rotary Park and Rigdon Park, linking all of these together. Long term planning provided access to the Naval Museum, leisure pools, and the Oxbow Environmental Learning Center with its varied attractions including three canopy rope bridges. Phase III extended another three miles to the Infantry Center at Fort Benning, awarded the best Military Installation in the world. 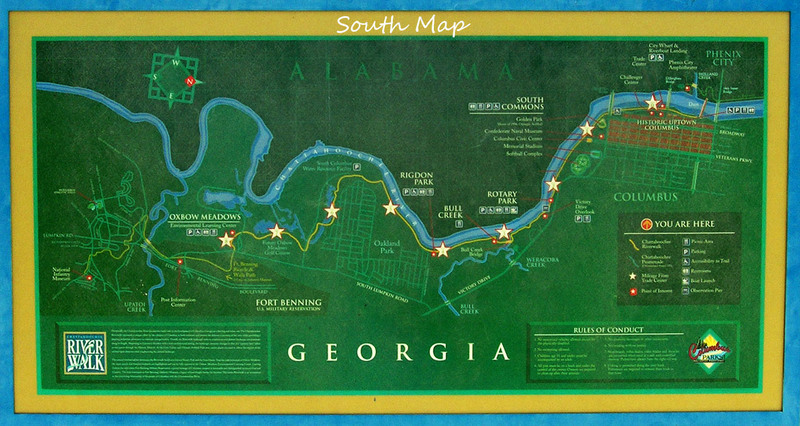 Phases IV and V included the northern section of the Riverwalk from TSYS campus to Bibb Mill, on to Lake Oliver. A twenty-two mile linear park that provides an asphalt trail with restrooms and access for all persons from the sports minded hiker or cyclist to the perfect spot for fishing. Columbus State University and the River Center have added to the usage of the Riverwalk by providing a home to the CSU School of Music in the downtown area by utilizing the area as a downtown campus.